From the moment we are old enough to feed ourselves we're nagged by our parents to stop playing with our food. Unless that is, it's Halloween when suddenly it's 'one rule for one', and they are allowed to mess about fabricating a giant pumpkin with a dangerously oversharp knive. Well, enough is enough. We say it's time for 'their one rule' to be extended and everyone should be allowed to play with their food. And no, we don't mean a food fight, we're not savages! 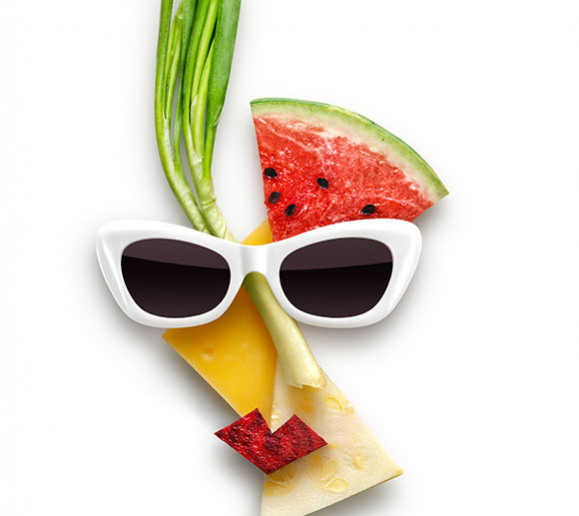 So bust out the fruit and veg and slice, chop and shape into crazy, creative masterpieces, as you 'play with your food'. Be random, be skillful, be funny, however you play with your food just lose yourself. To us, a handful of green beans, some sliced tomato, a small gherkin and some slices of pepper and celery no longer reminds us about our 5-a-day, but the possibility of forming a nifty bicycle. It wasn't that long ago when a half melon adorned with cocktail sticks of cheese and pineapple and two cherry eyes made a very convincing hedgehog table centre-piece. So get to it and let your imagination run wild.